Preventing the spread of disease is one of the foundations of a healthy community. Environmental Health helps to protect the health of the citizens of Monongalia County by doing Rabies Surveillance. Rabies Surveillance means monitoring and/or testing of animals that have bitten or scratched a person or another animal to see if rabies is the cause of the incident. Environmental Health also oversees Vector Control. This involves monitoring and/or eliminating conditions (like standing water or trash piles) that allow animals and insects that are known to transmit disease to humans (known as vectors) like mosquitoes and rodents to reproduce and thrive. Yes they're cute, but feeding wild animals like raccoons can lead to animal bites and even rabies. Please don't try to keep wildlife as pets. Whenever there is an animal encounter, we want to make sure that the person or animal that was bitten was not exposed to the rabies virus. Since rabies is fatal it is important to eliminate it as a cause of the animal encounter. The methods used depend on whether it was a domestic animal or wild animal that did the biting. When the Health Department becomes aware that a domestic animal (dog, cat, ferret) has bitten a person a Sanitarian will attempt to contact the owner of the biting animal. The Sanitarian will attempt to verify if the biting animal has a current rabies vaccine. The Sanitarian will also give the animal owner a Notice that the animal needs to quarantined. Quarantine involves isolating the animal at the animal owner's home, or another animal care facility depending on the situation, for 10 days to make sure that there are no sudden changes in the health or behavior of the animal that could indicate rabies. Quarantine helps to prevent exposure of other people or animals in the event that the biting animal shows signs of rabies. If the animal is still healthy and there have been no changes in the normal behavior of the animal at the end of the quarantine period then rabies can be ruled out as the cause of the incident. When a person is bitten by a wild animal the only way to rule out rabies is to have the animal tested for rabies. If a domestic animal is bitten by a wild animal, or bites and kills a wild animal, the domestic animal will have to be quarantined. The amount of time that the domestic animal will have to be quarantined will depend on whether the wild animal is available for testing and whether the domestic animal has a current rabies vaccine. So what should you do if you (or your pet) are involved in an Animal Encounter? If it is a severe bite or other type of emergency you should call 911. If it is not a severe bite or scratch you should still seek medical attention. Your doctor will decide what the appropriate treatment is for you. Your doctor will also report the animal encounter to the Health Department. Try to get contact information for the animal owner. The Health Department will need this information to verify vaccine status and order quarantine. If it is a severe bite or other type of emergency you should call 911. If it is not a severe bite or scratch you should call the MECCA non-emergency number: 304-599-6382 MECCA will refer your call to the Dog Warden/Canine Adoption Center. They will attempt to pick up the stray animal for testing if it is available. After calling you should seek medical attention. Your doctor will decide what the appropriate treatment is for you. Your doctor will also report the animal encounter to the Health Department. MECCA will give you instructions and refer your call to the appropriate agency. After calling you should seek medical attention. Your doctor will decide what the appropriate treatment is for you. Your doctor will also report the animal encounter to the Health Department. If you are bitten by a wild animal you should call 911. The 911 operator will give you instructions and refer your call to the appropriate agency (DNR, USDA, Police, Wildlife Removal Company) who will attempt to capture the animal for testing if it is available. If it is a severe bite or other type of emergency you should take your pet to your veterinarian. Your veterinarian will decide what the appropriate treatment is for your pet. They will also report the animal encounter to the Health Department. Try to get contact information for the owner. The Health Department will need this information to verify vaccine status and order quarantine. If it is a severe bite or other type of emergency you should take your pet to your veterinarian. If it is not a severe bite or scratch you should call the MECCA non-emergency number: 304-599-6382 MECCA will refer your call to the Dog Warden/Canine Adoption Center. They will attempt to pick up the stray animal for testing if it is available. After calling you should take your pet to your veterinarian. Your veterinarian will decide what the appropriate treatment is for your pet. They will also report the animal encounter to the Health Department. If your pet is bitten, or bites and kills, a wild animal. If it is a severe bite or other type of emergency you should take your pet to your veterinarian. If it is not a severe bite or scratch you should call the MECCA non-emergency number: 304-599-6382 MECCA will give you instructions and refer your call to the appropriate agency (DNR, USDA, Police, Wildlife Removal Company) who will attempt to capture the animal for testing if it is available. Please give your contact information and your pet's vaccine information to the person that your pet bit, or the owner of the animal that your pet bit. The Health Department does not fine animal owners and we will not come and take your pet away. We just want to make sure that rabies was not a cause of the incident. If an animal under quarantine is euthanized for any reason before the quarantine period is over you must contact the Health Department so that the animal can be submitted to the WV Office of Laboratory Services for rabies testing. Vaccine records for animals involved in an animal encounter can be submitted to the Health Department without having to obtain consent from the animal owner. 1. One of the easiest and best ways to prevent the spread of rabies is by having your pet vaccinated. West Virginia Code 19-20A requires all owned dogs and cats to be vaccinated against rabies. 2. Do not approach or handle any stray animals or wild animals, no matter how cute they are or how friendly they seem. 3. Know the signs of rabies. These fall into 2 categories: Behavior Changes and Neurological Changes. Since the rabies virus attacks the brain, as the disease progresses the animal will begin to show signs such as hypersensitivity to light, sound, or touch. Rabies can also cause paralysis of the throat and jaw muscles, which leads to the "foaming at the mouth" symptom that many people associate with rabies. The animal will start to have trouble walking or moving and may suffer from confusion or seizures. If you see an animal that is displaying the signs of rabies, call 911 right away. Do not attempt to approach or handle the animal. Also, please try not shoot and kill the animal if possible. The animal needs to be captured and humanly euthanized so that it can be tested for rabies. If you have to take action to protect yourself or your family from a rabid animal, please try not to aim for the head because the animal's brain needs to be intact in order to test the animal for rabies. There are some animals and insects, such as rodents, mosquitoes, and ticks, that can spread diseases to humans. Although these animals and insects are a natural part of the environment where we live, by minimizing our contact with them we can help to prevent the spread of disease. Since rodents like to live in trash piles, removing trash from your property is a way to control rodents. West Virginia Code 22C-4-10 requires all persons to have trash service or to take trash to a landfill at least once per month. 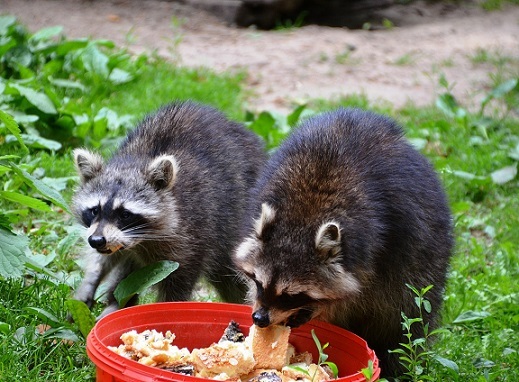 Since trash with food scraps will also attach other wild animals, such as raccoons, any trash stored outdoors should be kept in a covered and leak-proof trash container. Since mosquitoes need standing water to breed, removing standing water from your property, or at least around your house, will help to control mosquitoes. Any standing water, a bucket, an old tire, a pot, can be a potential breeding area for mosquitoes. If you live in an area where there are mosquitoes, be sure to use repellents when you are outside to help keep mosquitoes from biting you. If you have any pets, make sure that your pets receive a regular heart worm preventative. West Virginia Code 16-9 requires a property owner to properly dispose of any animals that die on their property. This is especially important if the dead animal is located in a creek or stream. Dead animals can also attract other animals such as rodents. Properly disposing of dead animals helps to prevent the spread of disease. Since it is not possible to remove ticks from the environment, you want to try to keep them from biting and attaching to you. When you are out in wooded areas or in tall grass you should put on repellent. When you come back make sure to check yourself for any ticks that tried to hitch a ride on you. If you find a tick attached to you, you can remove it by pulling it straight out (do not twist it) with your fingers or a pair of tweezers. If you find a ﻿deer tick (Ixodes scapularis)﻿ attached to you, contact your doctor.